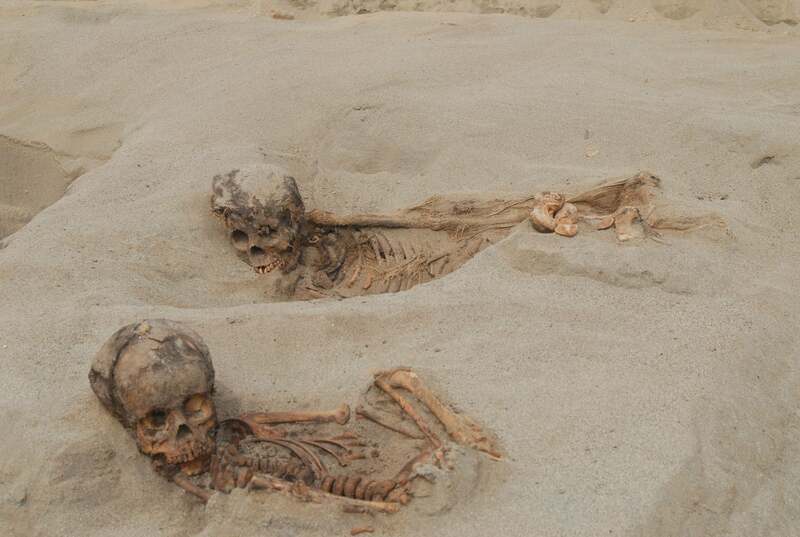 Archaeologists working at a 15th-century site in Peru have unearthed the remains of 137 children and 200 llamas in what’s now considered the largest mass child sacrifice known from the New World—and possibly of all time. The scene is almost impossible to comprehend. The researchers speculate it went something like this: One after one, the children were led to a clifftop overlooking the Pacific, the young llamas in tow. There, amid a salty ocean breeze and the sound of lapping waves, the children were made to lie down as a priest—with a skilful hand—cut open their chests, reaching in to pull out their still-beating hearts. The ritual sacrifice complete, the bloodied, limp bodies were placed carefully into individual graves, their faces positioned in a westerly direction toward the sea. The llamas, none older than 18 months, met the same fate, their heads made to face east towards the Andes mountains. In all, 137 children and 200 llamas were ritually sacrificed in this manner. Three adults—two of whom suffered blunt force trauma to the head—were also killed. Such is the interpretation of what happened along the northern Peruvian coast around 570 years ago, as detailed in a new study published yesterday in PLOS ONE. The authors of the new study, led by Gabriel Prieto from the National University of Trujillo in Peru, claim it’s the largest single mass sacrifice of children and llamas known to have happened in the New World, the previous largest being the sacrifice of 48 children at Templo Mayor in Tenochtitlán, what is now Mexico City. The ritual sacrifice of so many children certainly seems barbaric—and it’s unquestionably horrific—but the civilisation involved, the Chimú people of Peru, were likely working in accordance with their spiritual and metaphysical beliefs. And as the new research shows, a terrible natural disaster seems to have struck this civilisation shortly before the ritual, which may have prompted the killings. Nawa Sugiyama, an anthropologist at George Mason University who’s not affiliated with the new study, said the motivations behind ritualised violence are complex and difficult to rationalise from a modern perspective, especially in such a brutal case such as this. “Though it may never be possible to satisfactorily recover or reconstruct [the reasons], what I can say is that this mass sacrifice was likely as astoundingly extreme to the Chimú society as it is for us, and would likely have signalled the prevalence of extraordinary circumstances answerable only to similarly extreme measures,” said Sugiyama. This Chimú site, called Huanchaquito-Las Llama, is located along the northern coast of Peru. This civilisation flourished between the 11th and 15th centuries CE, dominating a 600-mile-long stretch of the Peruvian coastline. The only other major civilisation in South America at the time was the Inca Empire, which vanquished the Chimú people around 1475 CE, roughly 25 years after the mass child and llama sacrifice. Excavations at Huanchaquito-Las Llama took place between 2011 and 2016, with the bodies scattered along a 700-square-meter (7,500-square-foot) area. Aside from the three adults, all human remains belonged to children, both boys and girls, who ranged in age from five to 14 years, with the majority falling between eight to 12 years of age. The llamas were typically under 18 months old. Physical, chemical, and genetic analysis suggests the children came from a broad cross-section of Chimú society, though future work is planned to learn more about each individual, such as which geographical region they came from. The bodies of the children were positioned such that their faces looked west toward the ocean, while the llamas were made to face east toward the Andes mountains. Radiocarbon dating of ropes and textiles found buried within the graves places the event at around 1450 CE, at the very apex of the Chimú civilisation. An analysis of the sediments found at Huanchaquito-Las Llama suggests the region had been hit with a natural disaster shortly before the ritual killings, likely a massive flood or heavy rainfall. This disaster, the authors speculate, may be connected to the mass sacrifice—a “climatic event” that could have “impacted the economic, political and ideological stability of one of the most powerful states in the New World” during the 15th century CE, the authors wrote. That the mass child and animal sacrifice was a response to a natural disaster is wholly conceivable, said Sugiyama. More evidence, she said, will be required to make more specific interpretations. That said, she found the method of sacrificing the children to be “extremely surprising,” as the degree of trauma inflicted on both the children and the llamas was atypical of New World cultures. “It would have been a bloody and visceral scene charged with powerful emotion,” said Sugiyama. As to why children and juvenile llamas were sacrificed and not adults, Sugiyama said it likely had to do with their transitional nature.